A group of marines who served during the Vietnam War recently reunited to recreate a moment that happened 50 years ago. The four friends took some photos in 1966 while stationed at Camp Pendleton, outside San Diego. The beach day took place mere weeks before they were deployed. 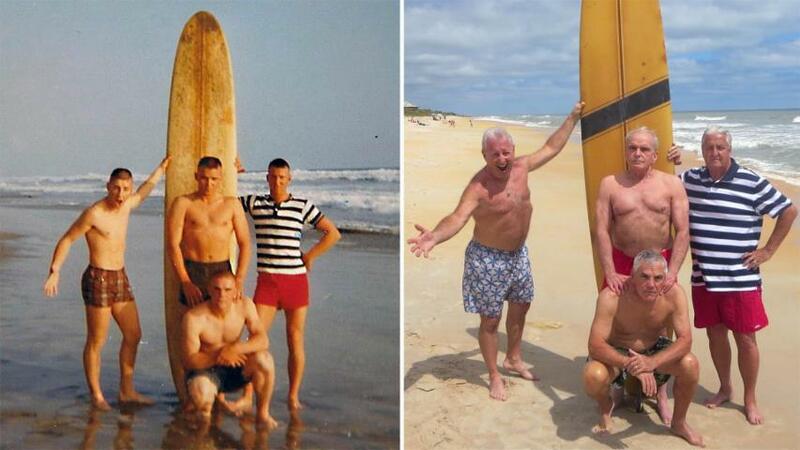 During an interview with FOX News, the gentlemen said they were best friends when the original picture was taken, but then fell out of touch after returning home from the war. Tom Hanks, not the actor but a 69-year-old banker, came up with the idea when he was flipping through an old photo album last year. He contacted the three other men, Bob Falk, 71, Bob DeVenezia, 70, and Dennis Puleo, 69, and they set a date. Hanks lives outside of Atlanta, while Falk, DeVenezia and Puleo all live in Florida. While the original was taken in Oceanside, California, the reenactment took place in Cinnamon Beach on Florida's east coast.